Some books come in your life for a reason; this would be one of those books that can change a life…if only you allow it to. 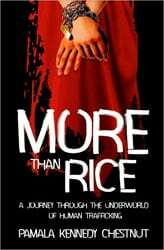 More than Rice is all about human trafficking and what it does to a person. Nobody should ever have to go through something like this, being ripped apart from your family and sold into slavery of some sort – for someone else’s gain…however, it happens more than we realize. The story starts out with a girl named Gabriela being abducted in Manila and ultimately sent on a cargo ship to Malaysia to join a group of 30 other girls that are being sent for the same reason. Throughout the story you will find Gabriela to be a very strong person, helping other girls through what they are dealing with. Each girl is given a number when they walk through the door – all clothes taken away from them, and a sheet to sleep in. They eat naked, they slept naked…and they were there to do what they needed to do with the men that paid for their time. When you are going through something like this – it’s like you go on autopilot, and do what needs to be done in order to survive. Through the beginning of the book, she would ask God what HE is going to do about this…and it came to her “what are YOU going to do about this”. The book showed me there comes a time in your life where you need to unstuck your head from the sand and get a grip, it’s not about you; it’s about helping someone who can’t help themselves. People who come together for one purpose oftentimes can help someone who doesn’t know what to do in order to get beyond it. For me, the book helped me to see you have to stand up for something – even if you are standing alone. My husband has been a victim of Paternity and Extrinsic Fraud – and still can’t get justice. By the end of the book, the conditions that the girls had to live under were no longer existent because people helped them to get the truth. May each of us, who read this book, try to do something to change something or help one other person in this world, in order to make it a better world for all of us. This is an awesome book – everyone needs to read. Wow, this book sounds incredibly powerful. I’m unclear but I am guessing it’s non-fiction? Thank you for your review, and I truly hope justice is served in your husband’s case.